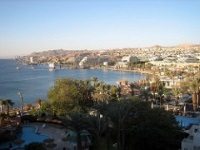 Eilat is a popular holiday resort located at the northern tip of the Red Sea. Its wonderfully warm temperatures seldom drop below 70°F (21°C). Many travellers visit Eilat to enjoy fantastic diving and snorkelling opportunities in the Red Sea: one of the world's most magnificent marine preserves. Brightly coloured coral fish, moray eels and even manta rays can be seen, while landlubbers will enjoy lazing on the beautiful beach and splashing in the shallows. Swimming with bottlenose dolphins in their natural environment is one of the resort's more popular activities. Bird-watching is a lesser-known activity in Eilat. But given that over one billion birds navigate between the Mediterranean coast and the Jordan Mountains, the area is certainly a terrific place to watch migratory flight. The Timna Valley National Park is located just north of Eilat and is a wonderful excursion for those wanting a day in the desert on camel-back or in a jeep. More active travellers can enjoy hiking in the desert mountains. The Red Canyon is a dramatic and beautiful feature of the area and attracts many hikers. Children tend to relish visiting the Hai Bar National Biblical Wildlife Reserve, which is a kind of zoo that collects and protects endangered animals mentioned in the Bible. Transport: The best way to travel is by plane from Tel Aviv; otherwise, the journey time is approximately four hours by car from either Tel Aviv or Jerusalem.